If you are looking for basic tradeshow tips such as "wear comfortable shoes", "plot out who you want to meet ahead of time" and "bring business cards", etc. this isn't the post for you. This is a post based on 19 years of attending Legaltech New York and most all other legal events and conferences. We make the joke annually that it's no coincidence that Legaltech is always within a few days of Groundhog Day. Legaltech's timing is unique in that it allows you to kick off the new year with a bang, however it can also make for a brutal week. With the morphing of Legaltech into Legalweek, this is even more so the case. Here are some Legalweek 2019 'coping' tips which will hopefully have you looking back at the week ahead with enthusiasm not vitriol. 1. There is no ‘cone of silence’! You wouldn’t believe the things we’ve heard in the common areas of the Hilton over our 19 years attending Legaltech. Realize that the property is a ‘hot’ spot and that you never know who is at the table beside you in the restaurant or sharing the elevator with you, so be discreet! Update: I'm going to extend this tip out two blocks in all directions. If you are at the Warwick or the Starbucks or the corner pub, it can still be full of Legalweek attendees or your competitors! There is a lot to take advantage of at Legalweek, so often plans for the event begin and end with working your booth. To maximize your investment, take advantage of all the opportunities available to network and/or promote your brand including connecting with partners, media, bloggers but also take time to meet with legal associations on-site such as ILTA , ARMA, AALL or AECDS. The first word in social networking is SOCIAL. In an industry with the staying power of legal - no one ever leaves, they just change companies/firms - it is just as valuable to make social connections with peers and contacts. During social events, stay social! Don’t start listing the bullet points for your product or bust out a laptop/tablet for a ‘quick demo’. Seriously… it happens all the time! Also bring your manners to the Twitter-verse and don't hog the hashtag. There are many people that participate in the Legalweek social media world so be respectful and don't hog the hashtag! If you are including the #Legalweek19 hashtag (which you should), don't send tweets from multiple company/employee accounts multiple times in a row. There are always a few people/companies that decide that social media success is based on the number of tweets they post. In fact, often those people are ridiculed and avoided, so don't be one of them! However, we've found a couple of creative ideas from the suspended glass box meeting room above to the "portable chair" to the right (try at your own risk!). Next year, someone should give them away in the exhibit hall! If you are a technology vendor/Legaltech exhibitor in town for the week, this is the perfect time to 'compare and contrast'. What are companies in your application area promoting this week? How visible are they? How is their exhibit floor/booth traffic? What are they doing that you might be able to pull off better? Did you know there is a full schedule of demos and product pitches happening throughout the week? And, there's a new Legaltech Product Innovation showcase and award to check out and vote on via the app. Don't come to town solely focused on booth duty and the 'wine and dine'. Be aware, take notes, and share it when you get home. 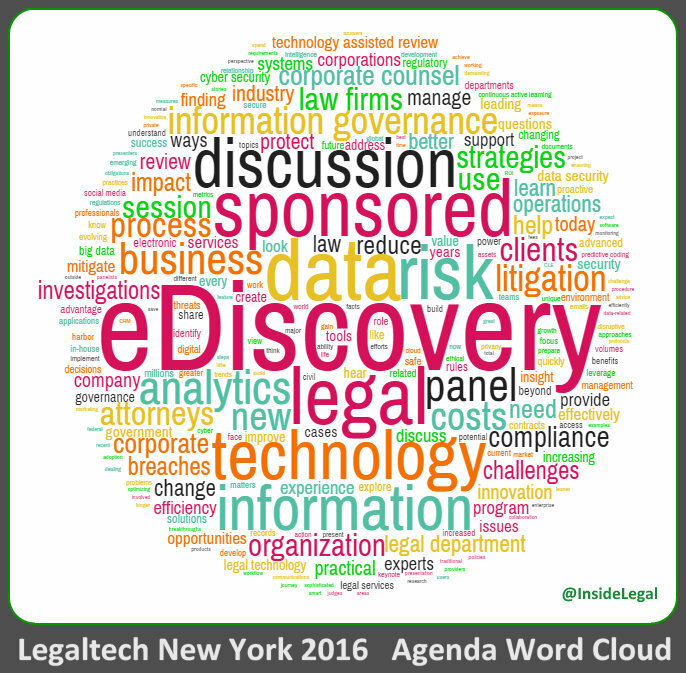 Starting next week, we will join thousands at what will be our 20th edition of Legaltech New York (LTNY). 2019 will mark the third year that LTNY is part of an expanded Legalweek format, with almost four full days of exhibitions, networking and legal sessions. 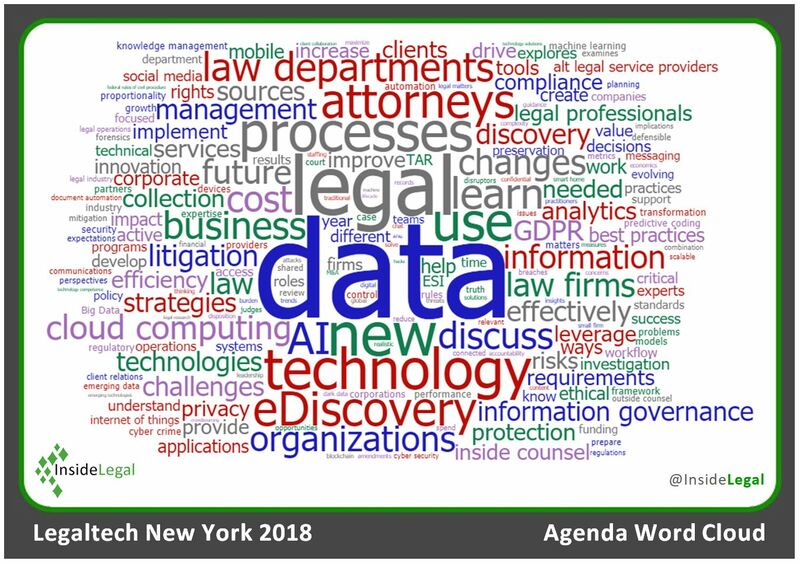 If you've attended LTNY before, you may be familiar with our annual Legaltech NY Agenda Word Clouds that provide a visual display of the words/themes from the Legaltech event's educational agenda and session lineup. If you aren't familiar with word clouds (you'd be surprised! ), the larger words/phrases are the ones most often referenced in the agenda text and so on. 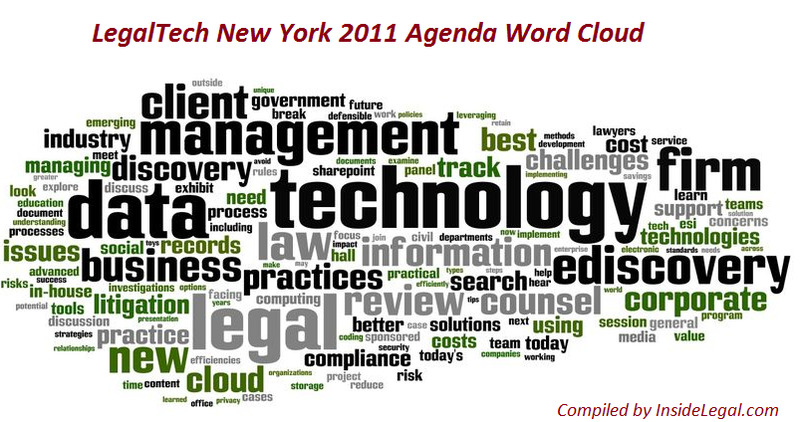 Let's take a look at InsideLegal's 9th annual Legaltech NY Agenda Word Cloud. To allow for comparison of this year's visual with the trends from past years, we've also included below the word clouds we created in 2018, 2017, 2016, 2015, 2014, 2013, 2012 and 2011. Take a look, click on the images to enlarge and compare for yourself. 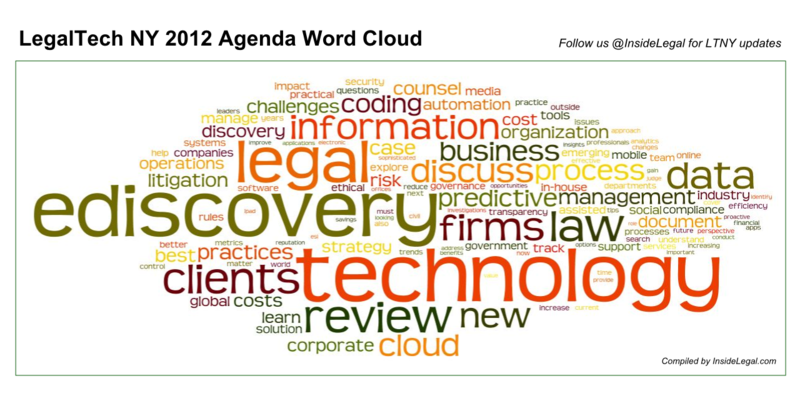 The word cloud was pulled from the agenda located at www.LegalTechShow.com. In July, 2015, ALM’s Legaltech News last unveiled the winners of the LTN Innovation Awards, an annual recognition of the best legal technology leaders, products and projects in the legal community. Three and a half years have passed and now it's time to once again recognize industry leaders in legal technology innovation. The 2019 Legaltech Product Innovation Competition is underway with 7 finalists having been named in early January. Erin Hichman, Senior Analyst with ALM Intelligence, is charged with organizing the 2019 innovation competition. We wanted to learn more ... how did this come about? how will the judging work? who applied? and who made the final cut. Let's find out. IL: What is the genesis of the award? Why launch this now? EH: Over the past year we’ve really witnessed the continued “explosion” of legal technology, but, more importantly, and interestingly, we are starting to see a new level of sophistication and innovation in product development. The legal technology market and landscape is changing so quickly - and is becoming crowded. We decided to launch the Product Innovation Competition this year at Legaltech to provide a platform for those that are using technology to improve the legal industry and approach traditional challenges and goals in a new way. It’s also a great way to help the consumer and user of legal technology understand what is available to them. 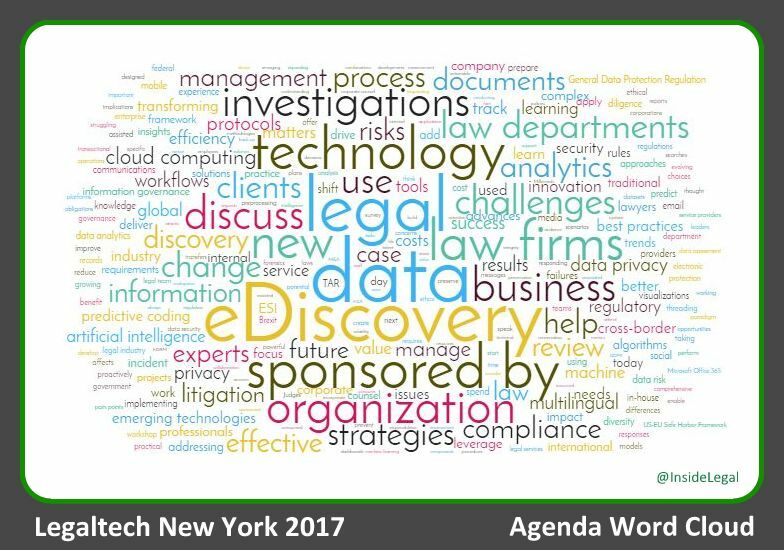 In most firms and legal departments, there are multiple stakeholders who must review and evaluate new technology, and many of those are in NYC the last week of January attending Legalweek. Given the depth and breadth of attendees, including many in-house legal professionals, we wanted to provide a platform for companies to launch new products with maximum exposure. IL: Please walk us through the judging and evaluation process? 1. Is the solution distinctive or fundamentally different from existing products? 2. Does the solution enhance efficiency and/or productivity? 3. If there a clear market need? 1. Does the product enhance efficiency and/or productivity? IL: What are the judges looking for in a finalist/winner? EH: Ultimately the judges are looking for products that are unique and differentiated from existing products in the legal industry that solve a particular challenge, and/or take a new approach to something that has been fairly static historically. IL: Can you touch on the application field, the recently announced finalists and the award ceremony? EH: There was a broad range of products, 25 in total, who entered the competition, from smaller newer entrants to the legal field to large and well-known names. Some key themes we saw reflected across many entrants was using AI and creating a more integrated, seamless and collaborative experience for the end-user. Fastcase Analytics Workbench enables lawyers and librarians to create their own reports using user-defined analytics, rather than pre-defined analytics. FRONTEO Patent Explorer 19 uses the company’s AI engine, KIBIT, to perform patent search and analysis. H5 PII Identification Solution helps legal and compliance professionals quickly and accurately identify likely PII content within Relativity. LexisNexis Context provides AI-powered insight to attorneys on judges and expert witnesses to better prepare for, present and argue cases. LexMachina Legal Analytics for Insurance Litigation includes more than 93,000 cases pending in federal court since 2009 to provide insight and trends in insurance case timing, resolutions, damages, remedies and findings. OneTrust Privacy Management and Marketing Compliance Software helps law firms better demonstrate regulatory compliance through its privacy management and marketing compliance platform. Tikit Carpe Diem Intelligent Time allows attorneys to write or dictate time sheets by using Natural Language Processing and turns them into time records. This tech analyzes and converts unstructured into structured data; attorney’s thoughts are transformed into fully formed time narratives. The Award Ceremony will be held at 10:40 on January 31 on the Legaltech LITE Stage, which is accessible to everyone at the entire Legalweek event. We encourage everyone to attend! IL: What does the future hold for the Legalweek Product Innovation competition? EH: We are very excited about this new addition to Legaltech. The response to the competition has been really good. We had 25 very interesting products enter, and after some close scoring, ended up with seven finalists. We think that this type of competition is the perfect fit for Legaltech and the overall Legalweek event, and are already making plans to include it next year.